Absolutely beautiful sink. This is an undermount sink and I chose granite. They look beautiful together. The sink is a great depth for a laundry room. 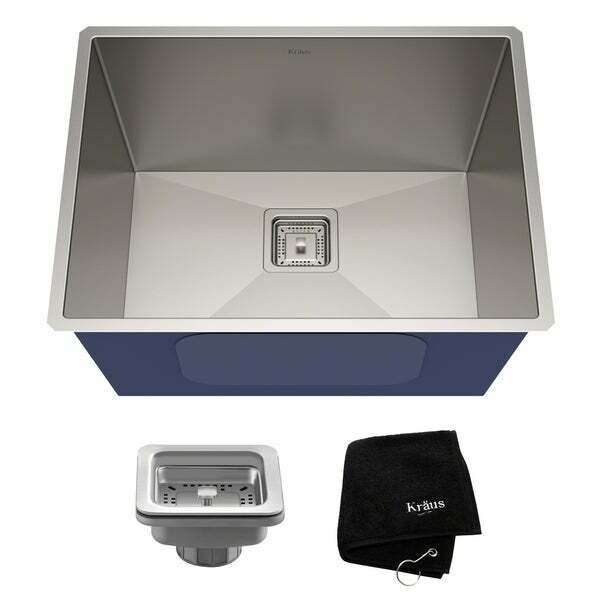 Upgrade your kitchen or laundry room with the sleek modern look of a KRAUS Pax Series utility / kitchen sink. Wash bulky items, rinse gardening tools, or even bathe a dog! This versatile deep sink is ideal for a utility room, workshop, or greenhouse. Dimensions 24.0 In. X 18.5 In. X 12.0 In. This is a fantastic oversized option for a utility room and, added bonus, the drain component is included. I like the stainless for the rough use it will get in the utility room, it’s super deep and it drains well. It also shipped faster than anticipated. Kraus sinks are literally the best! They come with the drain basket, grids and are well insulated! The inner corners are great on this also! The finish is great and seems to hold up better than most stainless steel sinks. This sink looks great in our laundry room and is really deep. It is great for scrubbing stains before tossing clothes into the laundry machine. The square drain also looks great for a more modern look! We paired a kraus faucet with this sink and chose to center mount it on the counter top and it all looks very nice together! Absolutely beautiful sink. Used it in our laundry/mudroom remodel with a Hahn Stainless Steel Joystick Single Lever Pull-down Kitchen Faucet and they look fabulous! Exactly what we were looking for!! This is a high quality item with heavy gauge stainless. Looks beautiful in the laundry room. Highly recommended! Even included a golf towel! Super happy with this sink. Installed in laundry room. It’s perfect! Searched far and wide to find a sink this deep at a reasonable price. It looks amazing installed. The square drain is an unexpected point of interest...all in all, exactly what I needed for the space. I love the depth of this sink. I only gave 4 stars because I have noticed some rust occurring around the strainer area. I have the sink for a couple of years and I use it in the laundry area. Bleach is used to soak items in the sink and it make cause the rust. It does need to be wiped dry or will be spotted and not as attractive but they do provide a towel for that purpose. We bought this for our laundry room. We wanted a deep sink that wasn’t too much like a utility tub. This works perfectly and fits right in with the rest of our decor. very good quality , nice packaging. looks high end. Size and shape is great, but it scratches very easily. Love, love, love my sink. So much prettier than one of those plastic sinks. Super cool square drain. Arrived super fast and packed very well. Extremely good quality and a very solid product, which looks great in our laundry. "My cabinet is 30” (L) x 24” (W). Will the KHU 25L Pax Xero Radius 24 inch single bowl sink fit on it and allow room for a standard 1 hole faucet?" "My cabinet is 22 in x33in. the 12 in depth isn't a problem. However, would there be there enough room with the 18.5 in width to fit the faucet behind it? Does the 18.5 stated include the outer edges?" The opening for my sink is 17 1/2 inches deep by 23" wide. 18.5 wouldn't be enough space for any faucet. "what size cabinet do you need for this sink? would it fit a cabinet that was 24" wide/18" deep?" Hello meb318, thank you for your inquiry. Unfortunately, the information you have requested is currently unavailable. You will receive an email notification once an answer is posted. Have a great day. It is exactly the dimensions I need for my mudroom! Love that it's 12 inches deep. Should hold a mop bucket easily!